Is It Worth Adding Google Advertising To Your Blog? Should You Add Google Advertising To Your Blog? Can you make money from Google online advertising? If you have a website or blog, you must have considered adding Google advertising pay per click ad placements to your site. It is one of the easiest ways to make money from your blog. 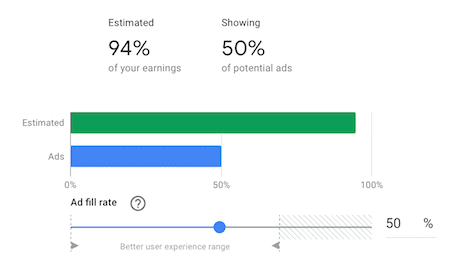 Google Ads work by trying to match what people are looking for when using Google search with ads placed by Google Adsense for products or services. Online marketing is a huge business now. But can the addition of Google Adsense ads to your site benefit you? For website owners, the answer is yes, no, maybe or possibly. Can you make money from the Google AdSense program? Here is a quick screengrab summary from my Adsense account. 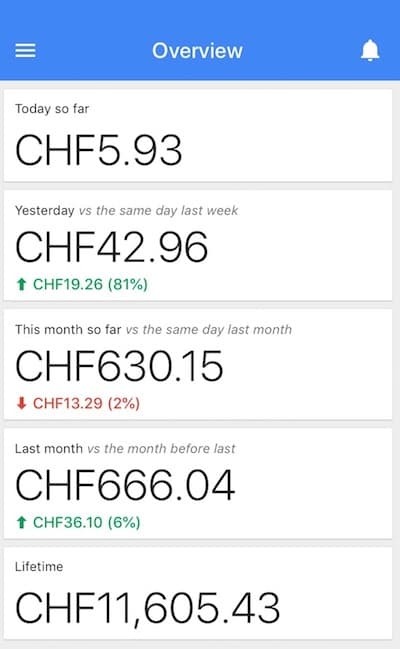 My earnings are in CHF (Swiss francs). One Swiss franc is worth about the same as one US dollar, so you can easily make a comparison. When people search using Google and arrive on my site, and then click on one of the ads that are displayed, Google pays for the click. But it comes with some conditions. Ads campaigns will only pay you if you can match your content with advertisers expectations. In other words, your content must relate to what readers are searching for with a search engine. Google will then match its ads to your content. Advertisers use Google Adwords to develop smart campaigns by ad group with a budget cap for their businesses. They want to get as much as they can from their advertising budget and each cost per click (CPC) and create ads to attract potential target customers. Many advertisers are small businesses who set a budget for their ad campaigns. Their ads are delivered based on your site’s quality score, landing page keyword relevance and matching content. In other words, you need to have published a lot of high-quality and relevant content on your blog to make your site attractive to advertisers. You also need a lot of traffic. An average click-through rate (CTR) for Google Ads is about 1-2%, so you need a lot of site visitors to make money. However, on average, one valid click on an ad can earn you between $0.50 and $$2.50. The way to steadily increase your traffic is to have your blog posts appearing high on search results pages for any given Google keyword. The more keywords you can rank for, the more traffic you will get. It might seem strange, but less is usually more when it comes to displaying ads and making money from your AdSense account. People are blocking ads more and more with free browser ad blockers. It is no wonder. AdSense publishers such as newspapers are the most guilty for creating an awful user experience by adding far too many ads. Banner and sidebar ads are a terrible distraction. Not only that. Multiple ads above the fold of a site will make the site extremely slow to load. I love reading The Independent. But I do so with an ad blocker. I turned it off to get the screengrab above. The page takes ages to load, and then flickers and reloads due to all the ads. If you want a tip about what ads to show, pay close attention to ad sizes and avoid banner and sidebar ads. The best approach by far for ad positioning is to use in-line ads and place them below the fold. Here’s an example of an in-line ad unit. Above the fold means what a visitor first sees when they visit a new page on your site. They then need to scroll down to read more of your post or article, which is below the fold. You will notice that on all the articles on this site, you never see an ad when a page first loads on your laptop, tablet or phone. Readers will scroll if they are interested in your content. If they do, then an advertisement inserted into your article will be served and have more value. Not only that, an ad below the fold will not slow down your initial page loading speed as much. 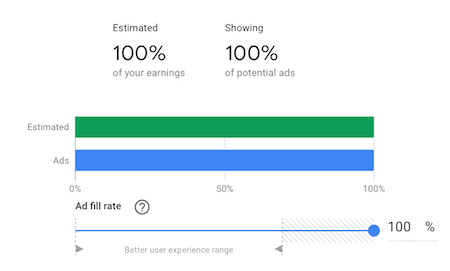 Contrary to what you might imagine, more Google ads do not necessarily mean that you will make more money. 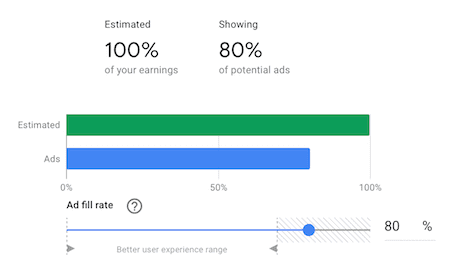 The smart way to manage ads and to earn advertising income from paid search is to use the Google Adsense Ad Balance tool. What it does is reduce the number of ads that Google serves and publishes on your site by removing your poorest performing ad units. You can see by the three images below how it works. You can see that if you reduce the number of ads to 80%, the estimated income is unaffected. But cutting even further to 50% makes only a minimal difference to your estimated earnings. The benefit in reducing the number of ads in the display network is a better reading experience for your site visitors, and also less ad load on your site speed. On my sites, I have three in-line ads set for articles of over 1,000 words. But my Ad Balance setting is around 70%, so readers will see fewer ads on most articles. It is only my top performing pages that may show all three ads. It is proof that less is more when it comes maximising your return from search results. There are two basic criteria that your site needs before you consider adding pay per click advertising to your site. One is that you need good traffic numbers. At a minimum, you should be attracting at least 10,000 users per month. You can check this by using your Google Analytics account. It is possible to make some money if your site traffic is lower. But if you decide to add advertising, you will need to do a lot of work on increasing your visitor numbers. Increasing traffic depends on how well you use and apply search engine optimization (SEO). You can read more about SEO in our article about how to use competitor’s keywords to increase traffic to your blog. The second is that your blog must be focussed on a particular theme or topic. The subject you are writing and publishing about needs to be consistent so that advertisers are attracted to your site. As a simplistic example, if you write about cars, you can expect ads about cars. If you write about fashion, you can expect ads for clothes. If your site meets these two criteria, you can expect to make money and grow your business into truly monetized blogging. Another consideration is how Google ads will affect your site. You can expect a small increase in your site speed, but if your site is well optimised and passes the Google Speed test, you should not notice any great change to your site loading speed. For personal blogs and blogs that are not thematic, Google Adsense is probably not a good fit. Readers of these sites generally do not appreciate advertising. As well as that, rarely do personal blogs attract enough traffic to make it worthwhile. I have seven sites in total, but I only carry advertising on two of them. If you think it might work for you, and would like to participate in Adsense, you will need to sign up and apply for approval. Before you rush in, make sure that you read the Google partner terms of service. I know no one ever bothers to read terms and conditions, but in this case, it is vital that you know the rules before you jump in. Note that you do not need to open an Adwords account, as this is only for advertisers. You will need to wait until your site and your Adsense account are approved, so be patient. You can watch this video about getting your site approved. Pay-per-click advertising is not for every blogger. You should think carefully before you make a decision and determine whether your site has the potential to attract enough visitors to make your effort worthwhile. If you are participating in affiliate marketing, you should think about what effects there might be. Very often, companies with affiliate campaigns also advertise on Google. It could mean that ads on your site might compete with your affiliate links. However, there is an option to block ads on your site so that you can mitigate this competitive situation. Lastly, if you are concerned that advertising will have an adverse effect on your readers, it might be best to put your readers first and pass on implementing ads. ← What Is A Memoir And Why Is It A Hard Story To Sell?